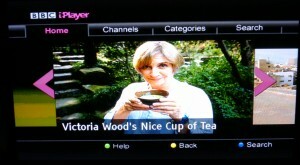 Victoria Wood’s Nice Cup Of Tea – on iPlayer, my Television, downstairs far away from my Internet router! Last month I return to BT. In fact, it is the first time BT has been my ISP (Interner Service Provider). Anyway, as Entanet could not offer me unlimited broadband I bought BT’s new Unlimited Infinity service. It means my Internet speed has increased from 16Mb/s to around 36 MB/s too. Although so far I have not actually noticed any major difference. So, to the set up. Like all BT Infinity customers I have my Internet coming through a new face plate on the wall. Main bonus of this means that there is no longer a need for an ADSL microfilter for each telephone. Now, my Internet comes into the upstairs office. I have a Netgear Wireless Access Point connected to the BT Home Hub 3 (free with Infinity, it comes with 4 ethernet ports – I use 2 for computers, 1 for wireless access point and 1 for the powerline homplug), because the wireless connection on the Home Hub was not good enough to reach the living room (at least, not a strong signal). But this did not allow me to connect my Humax Foxsat HDr 320Gb Freesat Hd Recorder + Iplayer to the Internet so I could not watch BBC iPlayer or the ITV player on the box. I think “Powerline” and “Homeplug” were actually 2 different standards but they are now one and the same, at least that is what I understand from reading Wikepedia’s page on HomePlug Powerline Alliance and also the www.homeplug.org/home/ website. These plugs allow you to extend your Internet over your electrical wiring at home. They come in various shapes and sizes, from simple 85Mbps plus to 200Mbps and 500bps. Some also have wireless on them too, and some are “pass through” which simple means that you can plug other devices into them, so do not lose a plug socked. I was a little worried that it wound not extend downstairs as I have a few circuits in the home, but I think now that all plugs is on the same circuit (kitchen may be separate). I ignored the manual and the cd (a really little one!) and just plugged in. All works fine. After a lot of reading around I opted for TP-Link AV500+ Gigabit Powerline Adapters with AC Pass Through (Model TL-PA551KIT). I got the starter kit with two in, which is the minimum. 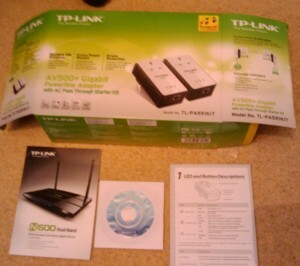 I chose the TP-Link AV500 because it is the fastest one on the market and has the AC pass throughs. As I also had a spare wireless router there was no need to pay extra for built in wireless. It also means that I have another 3 ethernet ports on downstairs which can be used for other computers if I need a faster connection. You simply connect one it to a wall socket near your Internet router and the other in a wall socket wherever you need it – behind the satellite box / television, by another computer etc. Connect the first to your router and the other to your PC or television / set-top box as normal. Hey presto, instant Internet! Note: only the Router and Wireless lights should show, not the ADSL as it is not picking up the external Internet connection, just extending from your other router. I had a spare router, so I added my Belkin wireless router to the downstairs socket, and then connect the router to the Humax box. I had to set up the wireless again though, so had to reconnect it to my PC, go to http://192.168.2.1/index.htm (where the Belkin router settings / admin are available) and enable wireless. I decided to change the router wireless ID to “Downstairs” so that it was clear which wireless was which (although the other is still NETGEAR). If you chose a powerline / homeplug with wireless this will all be set up for you already. I only chose one wihout as I have a spare wireless router. Your Internet Router Connects to the first Homeplug (as well as your PC, wireless router etc.). The Wireless Router connects to your television / set-top box. Of course, if you do not want extra wireless, you just connect the homeplug straight into your television / set-top box which has iPlayer or similar. See iPlayer on the Downstairs Tele in Action! This is possibly one of the worse videos you will ever watch. Blurry, shakey, no sound etc. The aim of the video is to demonstrate that iPlayer does indeed now work on the downstairs TV. I put on The Adventures of Abney and Teal as that is one of my son’s favourites at the moment. Big bonus – I no longer need to fill up the hard drive with Cbeebies programs! The Enormous Neep. That is a great episode! Note – currently the Wireless is not working. No idea why – not had time to look. It connects OK but Internet does not work ….